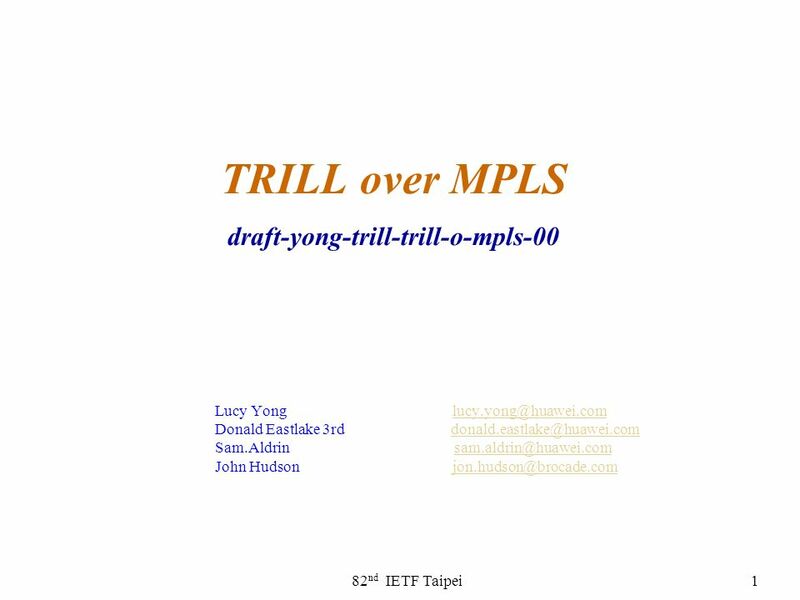 Download ppt "82 nd IETF Taipei1 TRILL over MPLS draft-yong-trill-trill-o-mpls-00 Lucy Yong Donald Eastlake 3rd"
History of VPLS at IETF Ali Sajassi November 12, 2002. Copyright © 2004 Juniper Networks, Inc. 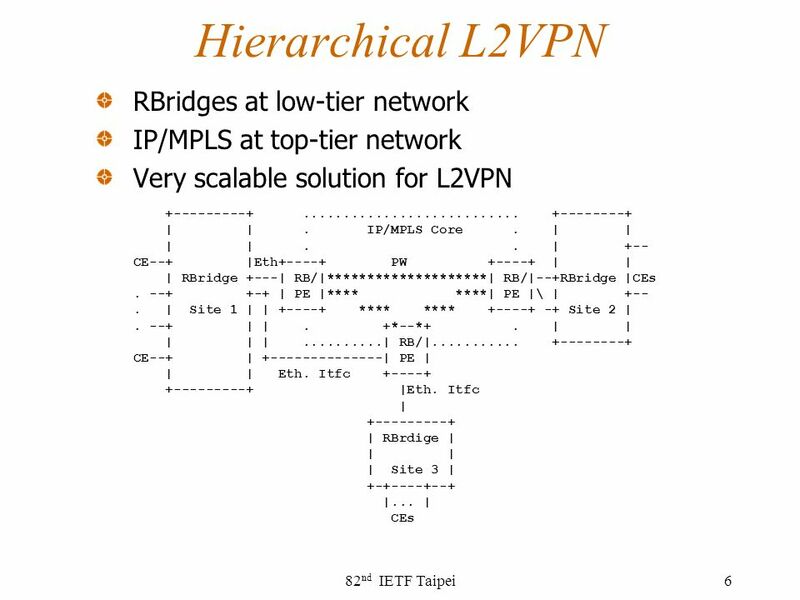 Proprietary and Confidentialwww.juniper.net 1 BGP based Virtual Private Multicast Service Auto-Discovery and Signaling. Copyright © 2004 Juniper Networks, Inc. 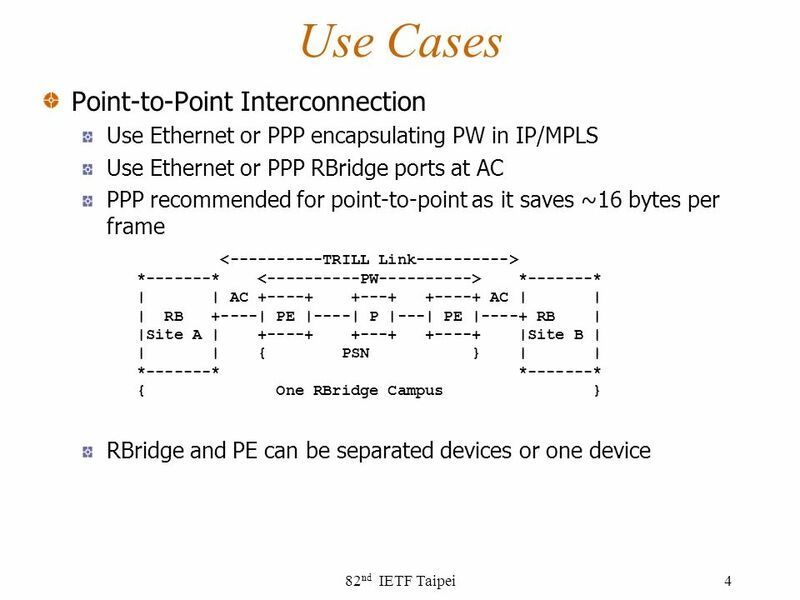 Proprietary and Confidentialwww.juniper.net 1 181th IETF - Quebec VPLS PE Model with E-Tree Support Yuanlong Jiang. TRILL ESADI draft-hu-trill-rbridge-esadi-00 Hongjun Zhai (ZTE) Fangwei hu (ZTE) Radia Perlman (Intel Labs) Donald Eastlake 3 rd (Huawei) July 20111TRILL. Copyright © 2004 Juniper Networks, Inc. 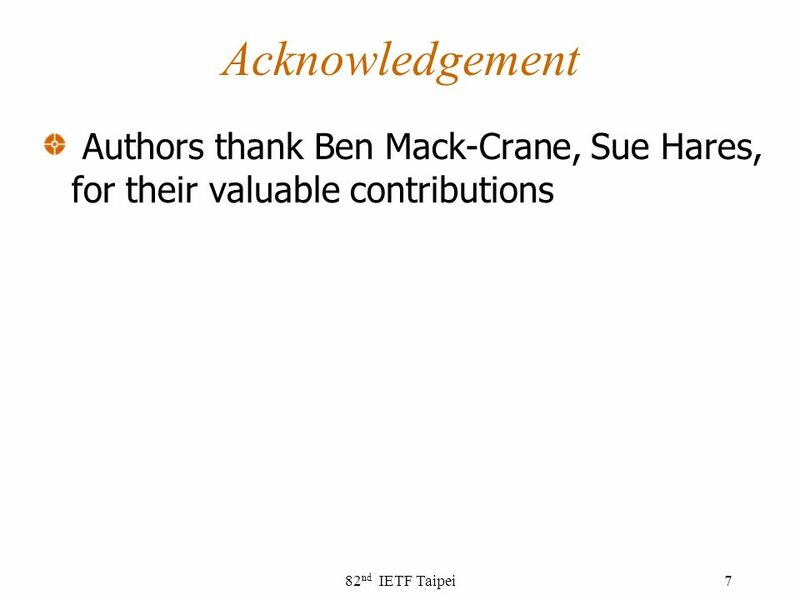 Proprietary and Confidentialwww.juniper.net 1 80th IETF - Prague VPLS PE Model with E-Tree Support Yuanlong Jiang. TRILL Header Extension Simplifications Donald Eastlake 3 rd Huawei Technologies 1July 2011. A GRAPH MORE LOVELY THAN A TREE © 2010 Brocade Communications Systems, Inc. CONFIDENTIALFor Internal Use Only 1 Joerg Ammon Systems. Copyright © 2004 Juniper Networks, Inc. Proprietary and Confidentialwww.juniper.net 1 Point-to-Multipoint Pseudowire Signaling and Auto-Discovery in Layer. 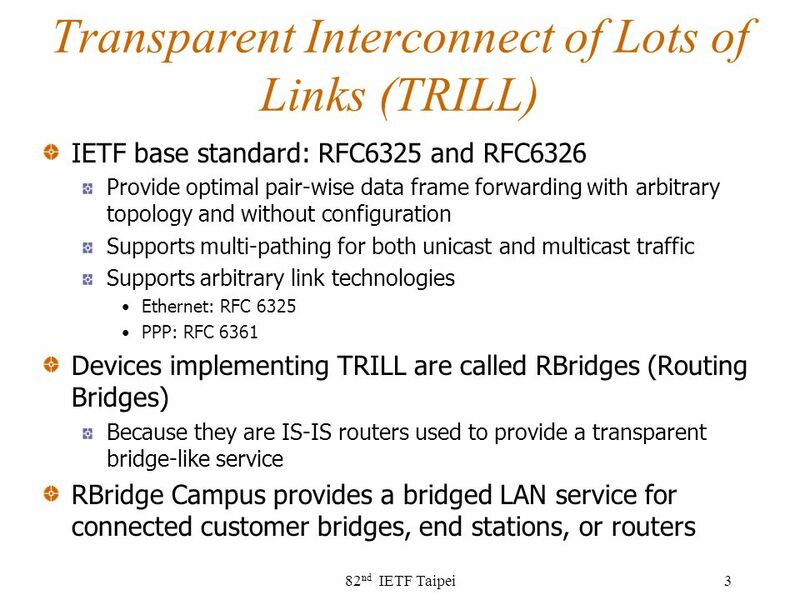 TRansparent Interconnection of Lots of Links (TRILL) www.iol.unh.edu www.iol.unh.edu March 11 th 2010 David Bond University of New Hampshire: InterOperability.